Based on our experience, it is important to understand the many inputs and ensure the Committee is making informed decisions with “eyes wide open” to avoid surprises. Awards should focus on specific intended objectives. 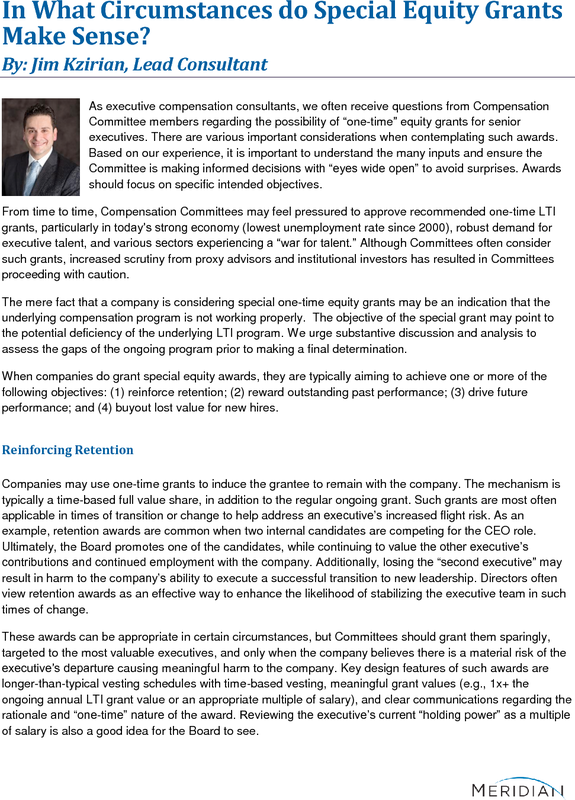 From time to time, Compensation Committees may feel pressured to approve recommended one-time LTI grants, particularly in today’s strong economy (lowest unemployment rate since 2000), robust demand for executive talent, and various sectors experiencing a “war for talent.” Although Committees often consider such grants, increased scrutiny from proxy advisors and institutional investors has resulted in Committees proceeding with caution. 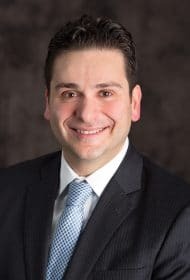 The mere fact that a company is considering special one-time equity grants may be an indication that the underlying compensation program is not working properly. The objective of the special grant may point to the potential deficiency of the underlying LTI program. We urge substantive discussion and analysis to assess the gaps of the ongoing program prior to making a final determination. When companies do grant special equity awards, they are typically aiming to achieve one or more of the following objectives: (1) reinforce retention; (2) reward outstanding past performance; (3) drive future performance; and (4) buyout lost value for new hires. Companies may use one-time grants to induce the grantee to remain with the company. The mechanism is typically a time-based full value share, in addition to the regular ongoing grant. Such grants are most often applicable in times of transition or change to help address an executive’s increased flight risk. As an example, retention awards are common when two internal candidates are competing for the CEO role. Ultimately, the Board promotes one of the candidates, while continuing to value the other executive’s contributions and continued employment with the company. Additionally, losing the “second executive” may result in harm to the company’s ability to execute a successful transition to new leadership. Directors often view retention awards as an effective way to enhance the likelihood of stabilizing the executive team in such times of change. These awards can be appropriate in certain circumstances, but Committees should grant them sparingly, targeted to the most valuable executives, and only when the company believes there is a material risk of the executive’s departure causing meaningful harm to the company. Key design features of such awards are longer-than-typical vesting schedules with time-based vesting, meaningful grant values (e.g., 1x+ the ongoing annual LTI grant value or an appropriate multiple of salary), and clear communications regarding the rationale and “one-time” nature of the award. Reviewing the executive’s current “holding power” as a multiple of salary is also a good idea for the Board to see. Companies will typically face scrutiny and should be prepared to answer questions around the core program’s retentive features, and why the Committee believes typical ongoing grants are not sufficient under the circumstances. Additionally, as discussed further later, disclosure, proxy advisory concerns, and communication with investors are important considerations to ensure the grant strategy is compelling. Special grants do not guarantee retention, but they communicate the company’s commitment and make attrition more expensive for the executive. The second likely scenario for one-time LTI awards involves providing supplemental rewards for prior outstanding performance. When a particular executive and/or the company has performed consistently well on most or all metrics, especially against its peer group and the broader market, Committees sometimes consider the possibility of additional equity grants. In situations where target pay is below or at the low end of market ranges, the Committee may feel further compelled to “do something.” The counterargument is that if the company has performed, incentive plans presumably have paid above target, and the actual / realizable value of equity grants is likely far above the original grant value. In this context, it is critical to review various perspectives of pay outcomes (realizable, realized, etc.) on a relative basis, as well as performance on a relative basis, to understand the degree of alignment between pay outcomes and performance. Committees might approve supplemental awards if incentive plans clearly under-delivered relative to the performance achieved. In a third likely scenario, companies might consider special grants in turnaround situations or transformations, where there is generally a higher risk of little or no payouts from incentive plans and equity awards. The awards can serve to incentivize executives to achieve the turnaround plan and to remain motivated by the prospect of stronger payouts for superior performance, if things go well. We have seen companies use grants to provide a “risk premium” in the context of highly uncertain circumstances. Generally, companies design such plans to closely align key priorities of the turnaround with compensation payouts. This may involve achieving outstanding levels of top line or earnings growth, achieving a certain level of margin expansion, or creating a higher-than-typical level of shareholder value. The performance periods of these awards may extend beyond the typical 3-year performance period. The objective is to provide the possibility of high payouts beyond what is provided with the regular incentive plans, but only when the company achieves a superior outcome. Awards from these grants will typically only generate payouts when shareholders have likewise benefitted over the performance period. Key design features of such awards are performance based vesting (even for stock options), performance objectives with significant stretch, and self-funding of payouts. Performance self-funds payouts because performance objectives for these types of programs are usually more aggressive than typical target goals. As with retention grants, investors and proxy advisors will likely question why the ongoing incentive plans do not adequately address the turnaround objectives. It is critical to stress test the goals and scenarios to ensure the Board is comfortable with projected pay and performance outcomes. Companies often find that the “regular” incentive awards already deliver significant compensation for the targeted “stretch” performance. When a company hires a new executive, there are often equity grants from the former employer that are not yet vested. In order to keep the incoming executive whole, companies will often provide new hire replacement or buyout awards based on the terms of the awards that the executive forfeited. These grants are a typical part of new hire packages and are usually required to attract the new executive to consider the possibility of changing employers. They are generally subject to less scrutiny and criticism from proxy advisors and institutional investors, as compared to the three approaches discussed above. Disclosure: Regardless of which category of one-time LTI awards a Compensation Committee is contemplating, a clear and compelling story in the Compensation Discussion and Analysis is critical. The disclosure should highlight the rationale and circumstances that the Committee considered, and clearly describe the shareholder alignment. Retirement impact: In general, special equity grants only vest when the specific time / performance conditions are met. Achieving a company-defined retirement definition, which may provide special vesting for regular LTI awards, should not typically provide acceleration or other benefits for one-time grants. Proxy advisors: Proxy advisors often call out one-time LTI awards as problematic, particularly for time-based awards, when the resulting overall total compensation is “misaligned with performance” according to their pay-for-performance methodology. Although the Committee may intend the awards to cover multiple years, proxy advisors fully reflect them in the year of grant in their elementary approach to assessing CEO pay and performance alignment. This places greater importance on pressure testing the proposed special grant under various performance scenarios, and understanding the likelihood of a heightened level of proxy advisor concern. Ultimately, the Committee should prioritize what is best for the business, but we advise clients that doing so with “eyes wide open” is key. Shareholder engagement: Through our consulting experience, we have learned that some institutional investors assume that the core plan is not functioning properly when the Compensation Committee awards supplemental or one-time LTI grants. Compelling disclosure of rationale and circumstances can mitigate this concern from investors, as well as questions from proxy advisors. However, regardless of the views and say-on-pay recommendations of proxy advisors, engaging in open and proactive dialogue with your largest investors is critical to be able to address any potential investor concerns. Committees should consider one-time equity grants carefully and be fully informed about the various pitfalls and likely criticisms. Although there are various risks associated with doing so, some circumstances warrant a special grant. When structured properly, the benefits of such awards can outweigh the potential risks and concerns.